Turkey Creek Timber, that’s what I call my land. It’s Turkey Creek, because Turkey Creek runs pretty much right down the middle of the property. It’s Timber, because I hope to be able to harvest some timber from time to time. One day, my wife and I may move here. I love my land and I want to take care of it. I want to see it healed and returned to a more “natural” state. I want to return our land to the “pine tree savanna” that used to be here a hundred years ago. 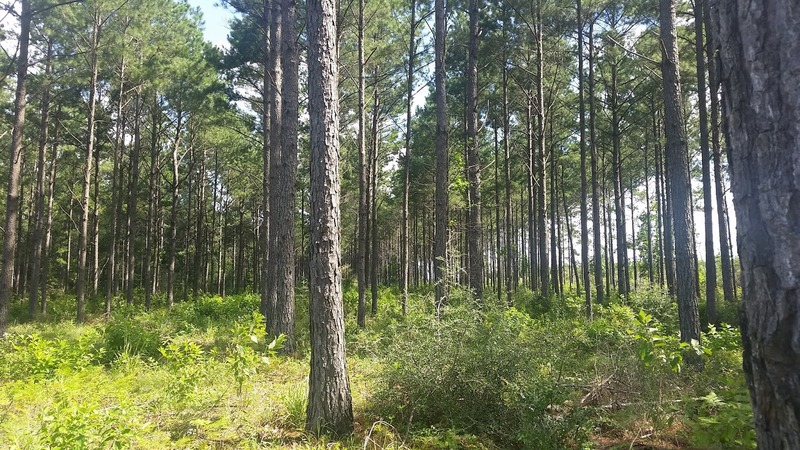 A pine tree savanna is a place where wildlife and diversity of plant life will thrive. It is the type of habitat that turkey, quail and deer love. Wouldn’t it be lovely to take a walk in my woods and have quail fly up as we approach; to see a flock of turkey in the distance and maybe even see deer? I don’t want it to be a rare chance encounter, but a daily expectation. I want my woods to be so wildlife friendly, that we have wildlife encounters almost every time we go exploring and walking in the woods. Here’s a picture of what it currently looks like and another picture of what it “should” look like. The reason the land is so overgrown, is that there hasn’t been fire on the land in over 50 years. In a more natural state, this land would have burned every three to five years. 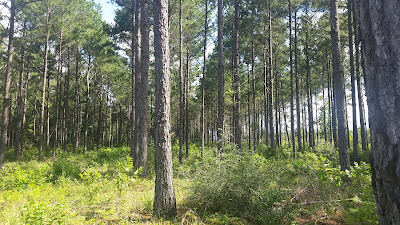 Pine trees are remarkable in their ability to thrive in a fire environment, but only if it is a fire that burns low to the ground. If the fire gets up into the canopy then it will kill the tree. Unfortunately, because of 50+ years of fire suppression, the understory, i.e. yaupon, of my forest has grown so thick and tall that in a fire, it would act as a “ladder” and carry the fire up into the canopy. My forest would die. 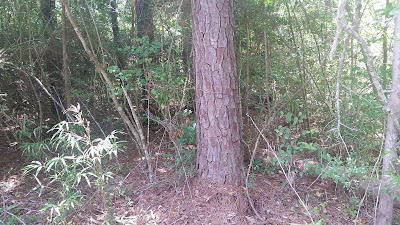 So the challenge for Brenda and I is to reduce the yaupon understory in our forest. We do that with our tractor. I have an implement called a grubber. It’s a device that grabs onto the trunk of a tree and bites harder and harder into the trunk as I pull on the grubber with the tractor. We pull the understory out of the ground, roots and all. 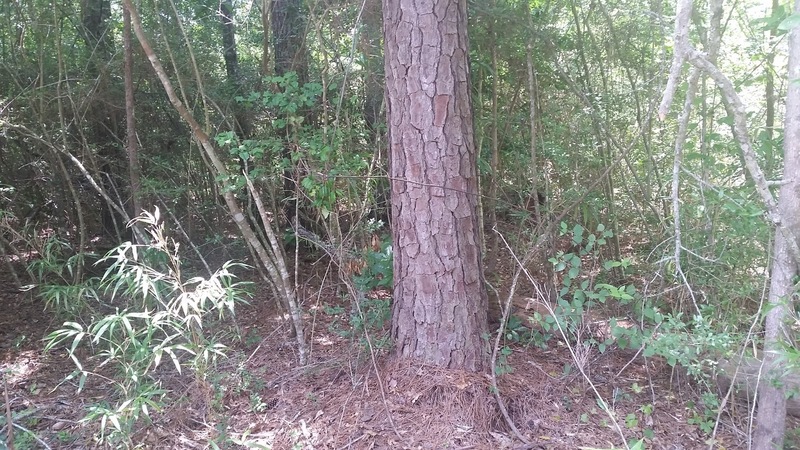 It’s a lot of work, but it seems to be the best way to permanently reduce the understory. I can’t wait to see how awesome this place will look once we get the understory under control. By managing my forest this way, I hope to one day be able to reintroduce fire back into the ecology. Lord knows I don’t want to keep pulling up yaupon for the rest of my life!